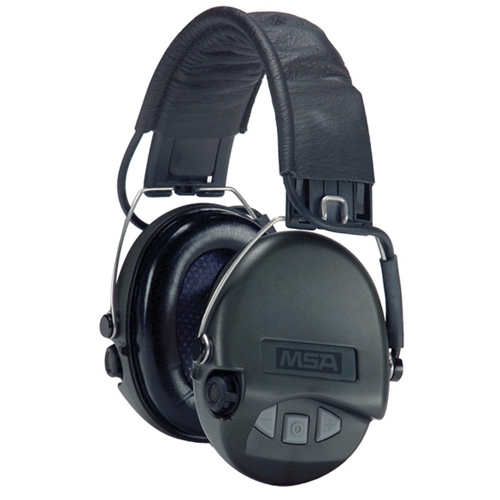 MSA 10061285 Supreme Pro Earmuffs, Headband The World's Finest Electronic Hearing Protection for Shooting! Separate ON/OFF and Volume Up/Down buttons! The MSA Sordin Supreme Pro earmuff is the most technologically advanced ear protection available on the market. This electronic earmuff utilizes New Compression Technology that eliminates clipping, and amplifies natural sounds up to four times the natural level. There is no other earmuff that can compare to its quality and well thought-out design. MSA Sordin Supreme Pro's slim cup and headband design allows the headset to be worn under hats and ballistic helmets. The digital electronic design of the Sordin Supreme Pro is based upon a custom designed ASIC* circuit and controlled by a microprocessor. This makes it possible to combine very low current consumption with high performance. Clear, natural stereo sound reproduction from the Sordin Supreme Pro. Application Specific Integrated CircuitSeparate ON/OFF Button and Volume Up/Down Buttons! One of the best features is the separate ON/OFF button and Volume Up/Down buttons. There is an auduble chirp each time you press a button so you know if you actually changed the setting. Plus, your volume setting is retained in memory and instantly restored when you turn them on.Providing optimum protection with high amplification, AUX input and watertight battery compartment. Sordin Earmuffs are shaped to suit both right-handed and left-handed shooters. * Compression Technology: 82 dB Max.